“Blogging is one of the most straight forward methods to start an internet business. It is financially lucrative, personally satisfying, can be built on something you already enjoy, and (in my experience) is by far the best way to get started making money online. You don’t need a lot of equipment, money, or even writing skills. I’m convinced anyone can start a blog from scratch, build an audience, and have a genuine income potential of anywhere from $10,000 up to $55,000 per month or more, if they follow the steps I’m about to reveal to you. And while this course is primarily designed create an online only business, the techniques and strategies can easily be redirected to local business blogging as well. Since I took that first Blog Mastermind course, I have used the skills I developed to create many profitable business blogs both for myself and for my clients. 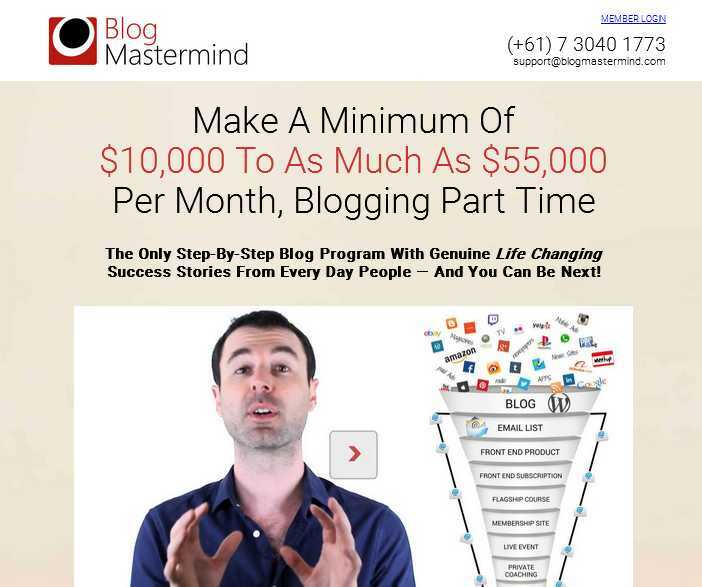 Granted the Blog Mastermind course at $997 USD (or $299 x 4 months) is not a course for everyone. But if you are truly serious about developing a successful business website that uses blogging as your main lead generator then you should save up those coins and make an investment in yourself and your future. Yaro Starak’s Blog Mastermind – the ultimate guide to blogging.